Moscow hasn't just embraced capitalism, it's capitalised itself into the world's richest city in the space of a couple of decades. Moscow has the most billionaires, the most popular nightclub is called 'The Most', and it also boasts of having the world's most expensive cup of coffee. Moscow has accommodation to suit every pocket, from budget hostels to hotels worthy of a Tsar - or an oligarch. Many of the best places to stay in Moscow are close to Red Square and the historic centre. Even before the fall of the Soviet era, Moscow was home to many very beautiful, very opulent buildings. The red brick of the Kremlin and black cobbles of Red Square are steeped in history and many treasures built by the Tsars stand as a reminder of the pre-concrete block era of architecture. But since then many of the less glamorous buildings - factories and warehouses - have been converted into more beautiful ones, now housing art galleries and museums and even clubs and restaurants. One of the best ways to experience Moscow is on a tour with a local. There are plenty of themed tours such as cooking and eating. Setting up one or more of these tours in advance is also a good way to get local insight into some of the best places to stay in Moscow. Alternatively, check out our guide on how to spend 36 hours in Moscow. If you're only here for a short time the best places to stay in Moscow will be close to the centre of town. The Metro system is good, but sprawling. One of the oldest buildings in Moscow is the Novodevichy Convent, originally constructed in the 16th century. On the convent's grounds is the even more famous Novodevichy Cemetery. Moscow has many other interesting churches, one of the most architecturally notable is the Church of the Ascension, built to commemorate the birth of Ivan the Terrible. Old Arbat Street is also worth a stroll and, if you can afford it, a visit to the Bolshoi. New Arbat Street is one of the best places to stay in Moscow if you're here to see and be seen. This is where you'll find some of Moscow's most expensive restaurants, bars and nightclubs. Tverskaya Street is another fashionable hangout, especially around the Yeliseev Grocery Store, which is like a Russian Harrod's. As far as the headline sights go most people start in Red Square; visiting St. Basil's Cathedral, Lenin's Mausoleum and the State History Museum. It's also possible to visit The Kremlin complex. Inside there are several beautiful churches, an impressive armoury and an even more impressive collection of diamonds. Gorky Park was a Communist era leisure centre, with an injection of culture into the mix, and is a fascinating place for appreciating the changes that have taken place here in relatively recent history. Moscow has a number of notable art galleries, the most famous being the Tretyakov Gallery and the Puchkin Museum. The Tretyakov is mostly works by Russians artists, which the Pushkin is more western, and has one of the world's most significant collections of Impressionist and Post-Impressionist works. If you want to pick up a few traditional souvenirs then head out to the Izmaylovo Market on the weekend. While in Moscow it's worth trying a banya - Russian bathhouse - where the menu involves a hot steam followed by a sound whipping with birch branches. With so many people now visiting the sights many of the best places to stay in Moscow are snapped up quickly so do make plans and book early. 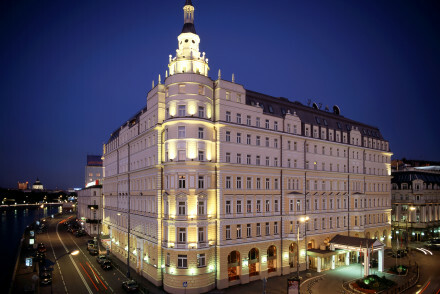 The Hotel Baltschug Kempinski's location, just across the river from the Kremlin and St. 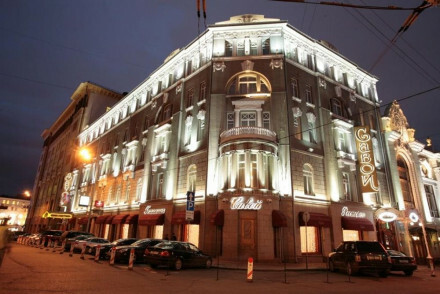 Basil's, makes it one of the best places to stay in Moscow. The fact that it's extremely luxurious also helps. Service is slick and you'll also find a top-notch spa and iconic views across the river. The Ritz Carlton is a good bet for luxury seekers. Here opulence is the name of the game with gilded interiors, sumptuous suites and a great spa. The 5* Hotel National is a top spot, boasting a wonderfully central location and set in an historic building. 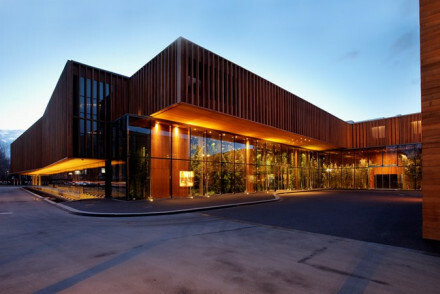 The interiors are classy with an understated opulence and there is a pool, lovely restaurant and spa. If you fancy a different sort of 5* experience then Mamaison All Suites Spa Hotel Pokrova should do the trick. 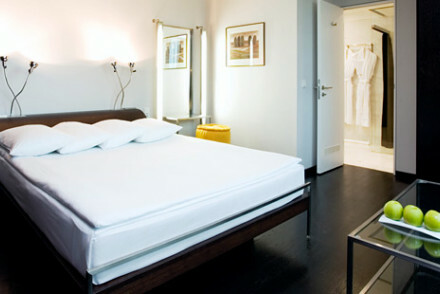 Offering chic boutique suites with eclectic furnishings this glitzy hotel boasts a top-notch restaurant and spoiling spa. Set in one of the 'Seven Sisters' high-rises, Radisson Royal Hotel offers palatial, classically elegant accommodation as well as a 31st floor bar offering superb views of the city. There are 5 restaurants to choose from or you can stay in a self-catering apartment instead. The Savoy Hotel boasts a quality befitting the name, providing smart classical accommodation and communal areas with breathtaking Rococo ceilings. Enjoy cocktails, champagne and caviar in the piano bar. A superb all round stay. 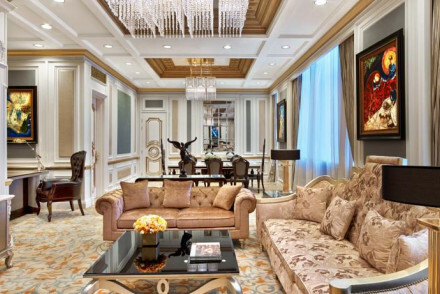 St. Regis Moscow Nikolskaya is opulent and has lavish suites harking back to a Romanov style of grandeur. Located in the heart of the city, it's a top choice for an upmarket city escape. The Golden Apple is a hip hotel just 20 mins walk from the Kremlin and by Moscow standards it is excellent value for money with rooms starting at around £100 per night including breakfast, if you book far enough in advance. The Hotel Metropol is the grand dame of Moscow’s hotel scene, and has been since she opened her elegant, Art-Nouveau doors over a century ago. You’re in the Tverskoy district, right across the the Bolshoi and very handy for the Kremlin, Red Square and St. Basils. 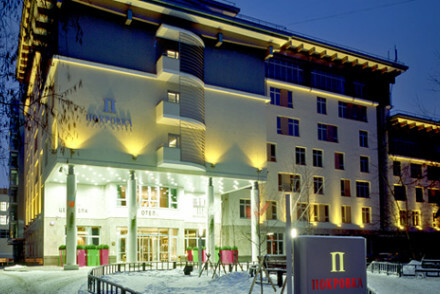 The Barvikha Hotel & Spa is located in Moscow's smartest suburb and is a seriously cool hotel. Minimalist chic is the order of the day. Come here for a serious spa break, where they give you a full health evaluation and devise individual therapy programmes! You are best visiting in the summer when the average daily temperature reaches 19°C in July. This is also when there is the most daily sunshine at 9 hours per day. The winters are bitterly cold so definitely avoid coming at this time if you want to head off sightseeing. Moscow is served by three airports: Sheremetyevo Airport, Domodedovo Airport and Vnukovo Airport. These all have public transport links to take you into the city. British Airways fly direct from Heathrow to Domodedovo, whilst Aeroflot go from Heathrow and Gatwick to Sheremetyevo. The journey time is usually just under 4 hours. Browse through our list of all the best places to stay in Moscow. Read our guide on 36 hours in Moscow. Widen the net and search through our recommendations of the best places to stay in St Petersburg. A glaringly colourful hotel in a very central location. Contemporary rooms awash with primary colour have all the mod cons. Good restaurant and lively bar. Excellent value for its location. A fantastic Five Star hotel in a central location. Historical architecture and traditional opulence create an air of royalty. Palatial rooms and suites in pastels with lots of gilt. Excellent restaurants, bars, and spa. A time capsule for the luxury traveller. A Five Star hotel with the wow factor. Enormously chic boutique suites with vast space, all the mod cons, eclectic furnishings, some with jacuzzis and kitchenettes. Fantastic restaurant, bar, and extensive spa. A great choice for the luxury traveller to experience Moscow glitterati style. Magnificent five star hotel set in of Stalin's 'Seven Sisters' that punctuate the Moscow skyline. Opulence personified with palatial rooms, a lavish spa and an incredible panoramic skybar. The perfect sanctuary to escape to after a day's exploring Moscow, and a superb location right on the river. Bar - The Mercedes Bar on the 31st floor boasts some of the best views of the city. Views - Book a room in one of the upper floors and you'll be guaranteed a stunning river or city view. Sights nearby - Two miles from The Kremlin and Red Square, easily accessible via the Moscow Metro. Historic hotel patronised first by Russian Literati and then the Communist elite. Totally renovated by revered Italian architect Leonardo Tognoni. It now boasts glorious gilt and gold, marble floors, swags and tails plus breathtaking original Rococo ceilings. A superb five star institution. The grand dame of Moscow’s hotel scene still reigns supreme, over a century after her elegant Art-Nouveau charms first seduced guests. 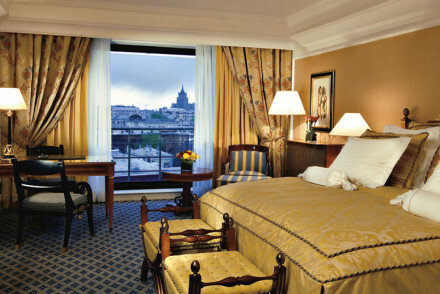 Today, visitors are cocooned in reassuring five-star luxury in the heart of the capital’s buzzy Tverskoy district. Sights nearby - Situated opposite the Bolshoi theatre! Alexander Garden, Saint Basil’s Cathedral, Red Square and the Kremlin are all close by. 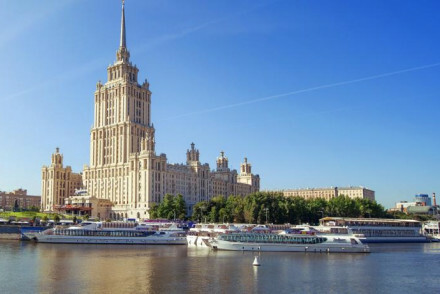 Ideally located just across the river from the Kremlin and St Basils Cathedral, this luxury hotel offers stylish decor, top notch spa with indoor pool and iconic views - a perfect property for both leisure and business travellers. Sights nearby - Just across the river from both the Kremlin, St Basils & Red Square. All are easily reachable on foot. Views - Fantastic views to St Basil's and the Kremlin. 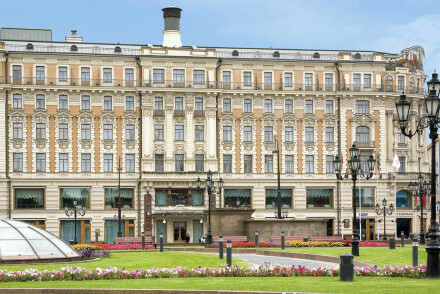 Just off Red Square & next to the Kremlin, the dramatic & iconic Five Star Ritz-Carlton is pure luxury and opulence: gilded interior with chandeliers and columns with gold pilasters. Sumptuous suites, sumptuous cuisine. Magnificent views of the city from the rooftop 02 Lounge. Divinely decadent. Opulence at every turn in this stunning Moscow hotel. Harking back to a Romanov style grandeur, the rooms are adorned with lavish furnishings and extravagant decorations. Right in the centre of Moscow, it's perfect for exploring Russia's capital. Outstanding five star quality. Sights nearby - Ten minutes walk from Red Square. Understated, minimalist, ultra cool hotel in the smartest Moscow suburb, five minutes drive to the city centre. The spa & personalised nutrition are the main reasons for staying. All rooms are contemporary suites with huge beds and all the mod cons. A destination for those who want a serious detox. 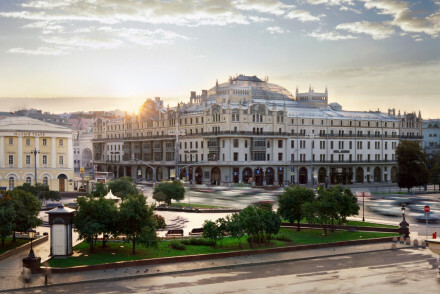 Designer - Designed by Antonio Citterio, the complex comprises hotel, boutiques, high-end restaurants & the best concert hall in Russia. Spa breaks - Guests complete tests and health evaluation, enabling therapists to design personalized treatments for one to seven days. Shops - Unique boutiques selling world-famous fashion and jewelry brands on site. Foodies - Detoxes based on nutritional menus that use fresh organic produce. Stalin-approved architectural design mixed with lavish contemporary finishes at this elite five star hotel. Exuberant interiors and floor to ceiling windows for the best views in the city. 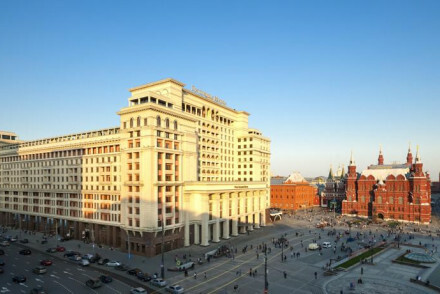 An admirable location, this hotel stands a few minutes from the Red Square. Five venues for dining on site. Families - An assortment of toys, board games, DVD's, game consoles and many other facilities are provided for the little ones. Local exploring - Situated right in the historical centre, within walking distance of all the important sights. Sights nearby - The Red Square, St. Basil's Cathedral and the Alexandrovsky Garden are all close by.